Pakistan VS Australia, 2nd ODI - Live cricket Score card between Pakistan VS Australia, 2nd ODI, Pakistan v Australia in UAE, 2019. Check out All cricket schedule for all series of major cricket playing countries including Pakistan, South Africa, Australia, India, Sri Lanka, Bangladesh, New Zealand, West Indies, England, Zimbabwe and other International teams as well. Scores and updates are live with ball by ball in real-time. 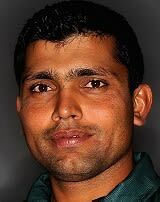 why junaid khan not played today?this is the only who taken a wicket,this is a wicket taker bowler..